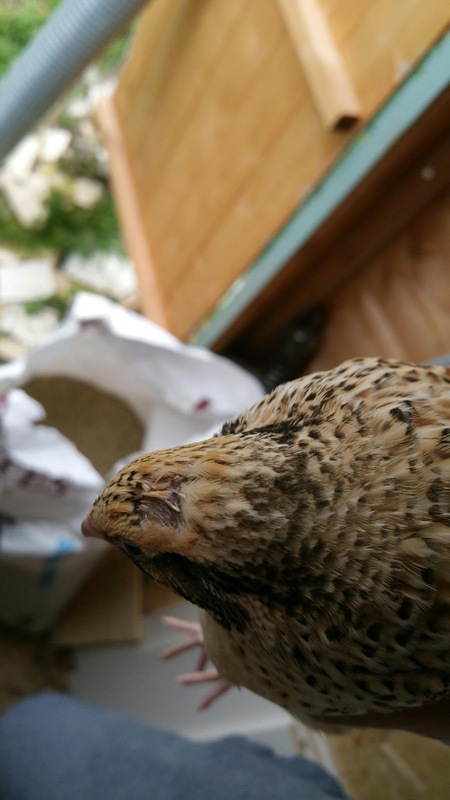 A couple of our quails are now sporting the latest fashion in bald spots due to a bit of pecking order going on. It doesn't matter all that much, birds will be birds and a bit of pecking is completely normal and nothing to worry about. 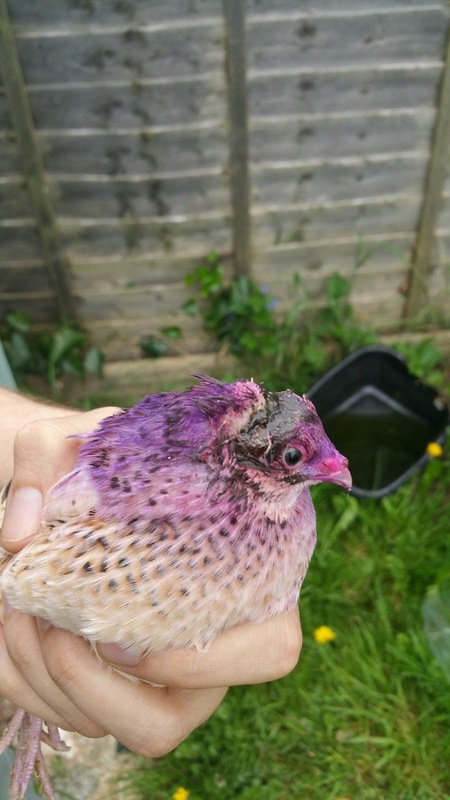 However if they break the skin then it can become a bit more serious, once a bird sees red on a wound they can have a tendency to persistently peck at it. This is why I am a little over cautious and if there is the tiniest bit of blood then I'll give them a blast of Violet antiseptic spray. The problem with quails is that they can be ruthless with each other, once they see red on a wound they peck and peck and PECK! They can quickly turn a minor bald patch into a bloody patch of skull, it is not at all uncommon for quails to scalp each other, particularly males fighting each other or being over-amorous with the females. You should have seen the state of this bird a few days ago before the spray went on! One of our birds was scalped a few days ago. A scalped bird is not a pretty sight, it's pretty gruesome. We don't hide this type of thing from the kids as we allow them to be involved in anything they show an interest in. I think it's important that children know it isn't always rainbows and butterflies, sometimes people and animals get hurt. Because of how removed from nature and reality we have become I imagine seeing a scalped bird would probably upset most ordinary children. That is why I'm glad our children are extraordinary. 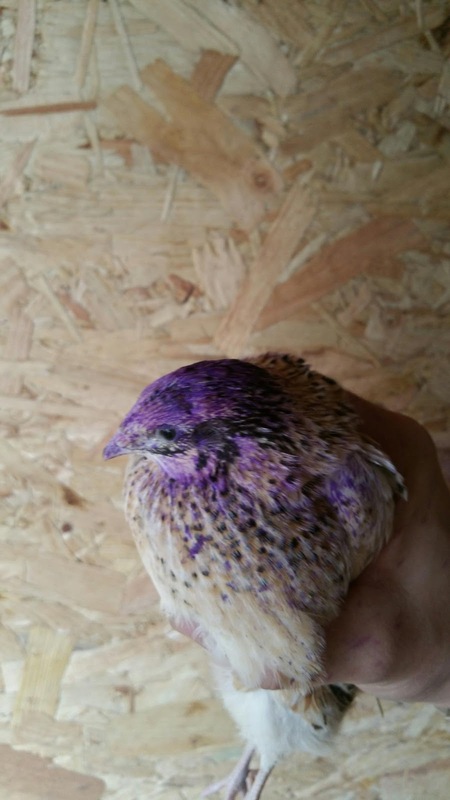 When Logan saw it he simply asked "Daddy can you mend the broken bird with purple spray?" I think if more people could face the problems in front of them these days instead of turning away then the world would be a better place. Do you let the little ones get involved with the "warts and all" side of things? We'd love to hear from you either way! 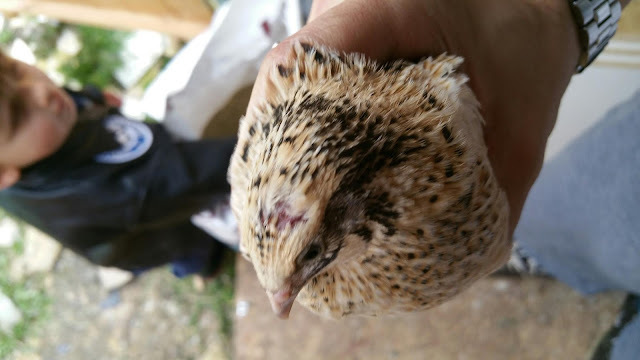 Chickens are worse, a flock will peck away at any wound and if not spotted will kill and eat the affected bird. I was raised to be aware of this as were most country children of my generation. Children are inquisitive and revel in the gory stuff usually. It's the way we grew up, good approach to your children's lives. I think you know my answer. The kids see it all, warts and all. Even if I shoot something I'll sometimes show them so they can see the animal up close. They seem to have a good understanding of death and the circle of life. What's your doing is the best way by far. In fact what you're doing with your place is just like we did we our house before. Nothing annoys me more than when people say they love to live like I do and grow they're own but don't use what they already have. At our last house everyone said I'd turned it into a mini farm yard, I was trying to use every square inch to produce something and you guys seem to be doing the same. Fair play.